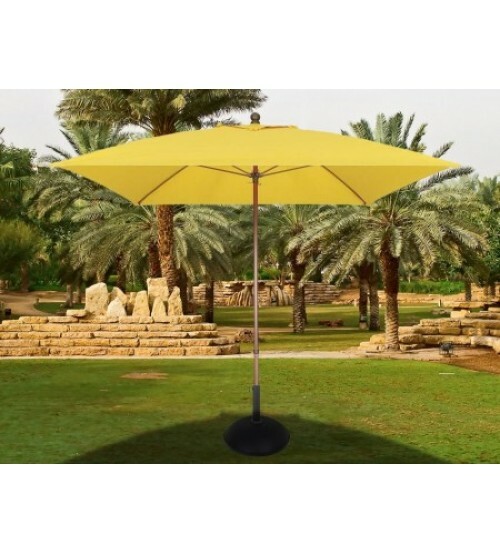 Fiberbuilt Presetigue Collection 7.5 ft. square Lucaya Umbrella has flexible fiberglass ribs, molded nylon joints, hubs and end tips for strength that improves the performance of the umbrella during adverse weather conditions. 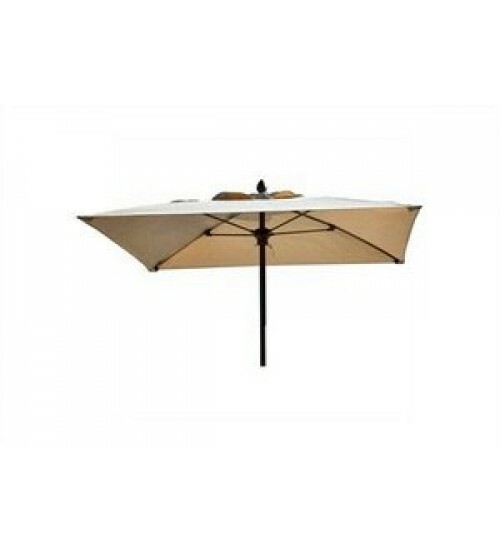 The Lucaya Umbrellas has a 1- piece 1.5 in. 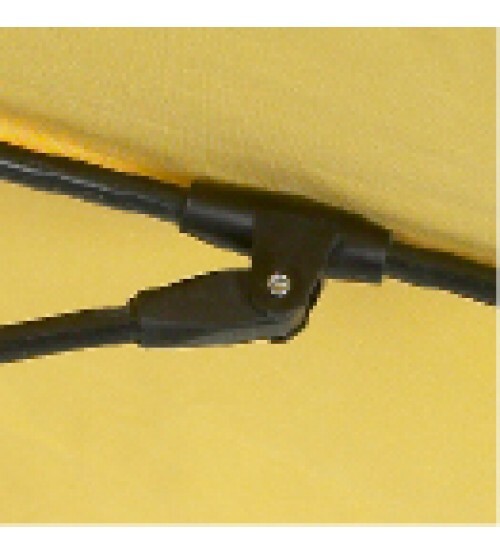 diameter powder-coated aluminum pole. This model has a pulley lift mechanism, no tilt, making it ideal for commercial uses. The innovative fiberglass support rib construction ensures strength, resilience and durability. Fiberbuilt umbrella has developed a full line of contract quality umbrellas that hold up to the harshest weather conditions - intense sunlight, high winds, salt air and driving rain - and will not decay or lose their shape. Fiberbuilt Umbrella’s flexible fiberglass ribs absorb wind gusts without breaking and last four to five times longer than traditional steel or wood ribbed umbrellas. The 7.5' square Lycaya fiberglass rib umbrella is available in several frames colors, and a large selection of fabric colors. Pole finishes are powder coated. Other finish colors are available for large orders. Consult factory. All rib, finial and hub colors coordinate with the finish color selected for the pole except  for Sahara which has Champagne Bronze ribs, finials and hubs. Custom top options include double vent, valance, alternating panels, trim, banding and logos. Standard tops are made of marine or furniture grade, solution dyed acrylic. Tops are also available in COM. Pulley & Pin lift is available in place of Push  Up & Pin. When ordering change the end of  the model number from PU to PP. Delivery: Please allow 2-3 weeks to fabric the canopies. FiberBuilt Umbrellas & Cushions warranties our two piece fiberglass ribbed Garden, Patio, Terrace, Market and Beach Umbrellas, and all wood umbrellas, as well as all bases, cabanas and upholstery work for a period of one year from the date of purchase, to the original purchaser, against defects in materials and workmanship. Additionally, fiberglass support ribs on our Market and Beach Umbrellas are warranted for five (5) years from the date of purchase. Prestige Collection Umbrellas (Augusta, Bambusa, Bridgewater, Contempo, Lucaya, Nitro, Palm and Riva) are warranted for a period of five (5) years from the date of purchase, to the original purchaser, against defects in materials and workmanship. 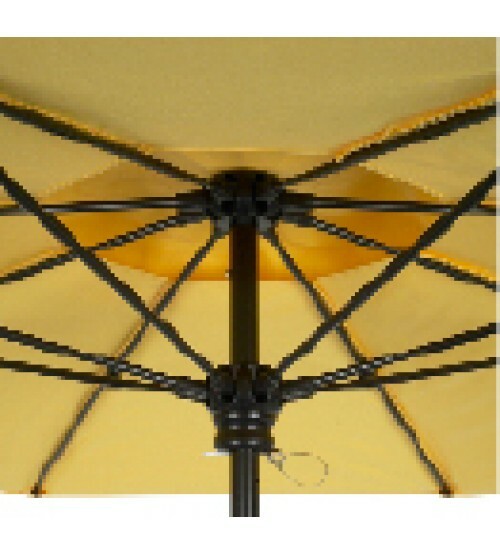 Fiberglass support ribs on all Prestige Collection Umbrellas are also warranted for five (5) years. For the warranty to apply, all umbrellas must be secured in a properly weighted base. Though our umbrellas have successfully passed wind tests over 50 miles per hour, FiberBuilt Umbrellas & Cushions does not recommend allowing umbrellas to remain open during storms or strong winds. Customer is responsible fortaking the umbrella down when winds reach unsafe conditions. Normal care and maintenance of products is required to insure years of problem free use. Damaged umbrellas should be immediately taken out of service. This warranty does not cover the umbrella pole, crank or tilt, glass tops, glides, normal fading of fabrics and finishes and chemical stains. This warranty does not cover any damage due to acts of God, abuse, misuse or vandalism incurred to the umbrella after purchase, nor does it cover customer's own material. For warranty to apply products must be properly cared for and maintained. Modifications made to the product after production may void warranty. This warranty does not provide coverage or reimbursement for loss of use, time, inconvenience or other damages resulting from any defect in the product. To find out more about our warranty or to file a claim, please contact our customer service department at: 800-738-7229. No returns will be accepted without prior approval. This warranty does not cover any damage due to acts of God, abuse, misuse or vandalism incurred to the umbrella after purchase, nor does it cover customer's own material. For warranty to apply products must be properly cared for and maintained. Modifications made to the product after production may void warranty. This warranty does not provide coverage or reimbursement for loss of use, time, inconvenience or other damages resulting from any defect in the product. To find out more about our warranty or to file a claim, please contact our customer service department at: 866-667-8668. No returns will be accepted without prior approval.